Around 2002, I interviewed a friend of mine for the English-language textbook I wrote for my students at Dongguk University. I’m in middle management at a multinational corporation. I think it’s important for women to feel confident on the job. Of course, that means you need to know you’re competent. Nowadays I do, but I was very different when I started working. 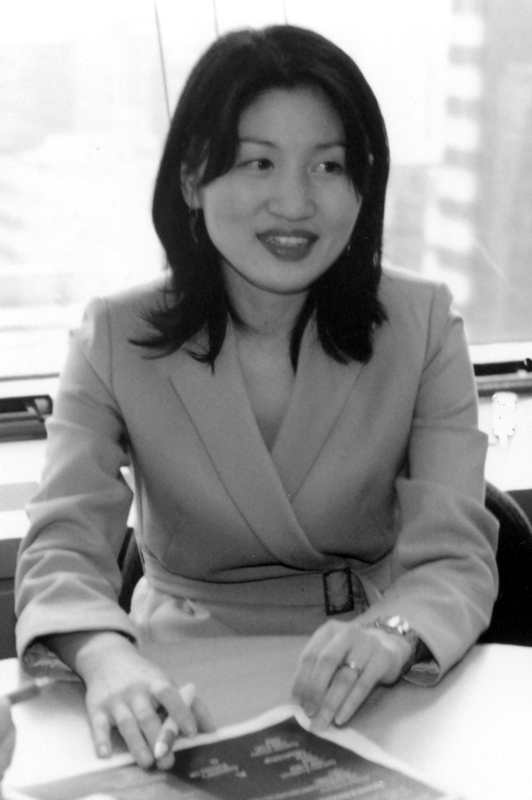 I was a very typical Korean woman—you might say a “little office flower” who couldn’t talk with foreigners and who was very dependent on the managers for everything. When I made mistakes, my superiors were happy to cover for me. Later I realized that they liked being able to show that they could do that and they didn’t actually want me to have any responsibility of my own. I was also very Korean in that I was far too concerned about what other people might think of me. One weekend I came over to work and found a visitor there from our home office in Germany. I said hello but just ducked my head down and ran to my desk because I was afraid he might want to talk with me. Several hours later, he came to my desk with a piece of paper that had just one word written on it, “light.” On the weekends the light switches in the office didn’t work. You had to call someone at the building office to get them to turn the lights on. The visitor was very understanding and was making it as easy as possible for me to communicate with him. Three years after I started working here, I had an opportunity which changed my life. The company had set up a project in Thailand to discuss in great detail all the procedures of the business and specifically how they are handled in each country. I was sent as the Korean representative in the customer service module. Now, since I’d been on the job I’d been working on a master’s degree in commercial education—I’d just graduated—so I hadn’t had time to work on my English. In Bangkok all the people in a particular module would be in the room together, about twenty people. The foreign consultant would introduce an issue, and then people would discuss all aspects of it from A to Z. I couldn’t speak, so every night I’d work until midnight writing down what I should have said at the meeting. The next morning I would give my paper to the consultants and explain that this is what I’d wanted to say the day before. At first they were shocked and said, “You should have told us this yesterday.” They were annoyed because they’d already moved on to something else. But since I felt I had no other options, I continued to do this every day. Once I also made a big mistake. In most countries, when an engineer is sent out to a customer, the charge for his work is computed on an hourly basis. In Korea, it’s on a daily basis. I’d missed that. By the time I saw my mistake, everything had already been agreed and cosigned. When I explained what had happened, I was told, “Sorry. That’s business.” There was no way to put it right without renegotiating the whole thing. Eventually a senior consultant did find a way to fix it, but in the process I learned that I had to be responsible for my mistakes and I had to be very careful. Nowadays, I know that I’m a second language learner and that this is okay. But back then I was trying to hide it. Since I was very quiet when people were speaking English, I felt I also had to be very quiet when they were speaking Korean. Otherwise, people would know I wasn’t just shy. Fortunately, there were two German ladies, a woman in my module and her friend, who looked at this Asian woman who always worked until midnight, and they approached me to ask if someone was putting pressure on me to work like this. When I said no, they decided they were going to show me how to enjoy myself. They asked me to go out and do things with them after work, and they were very persistent. I finally agreed. We went to a Thai massage place and then to a restaurant for dinner. Later I also went out to some nightclubs to dance with my colleagues and discovered that people who did that kind of thing were not strange. They were very normal people who were just relaxing and enjoying themselves. I learned that that was an important part of life. Since then I’ve discovered there’s a big world outside my little box and I can go out and see it on my own. I even went to Mexico and Peru by myself to look at the ancient ruins. Back in Korea, I’ve found that for a Korean woman the workplace can be tricky. I know I’m an expert in my own little area. If people speak directly about issues, then the meeting can be short and efficient. I was among a small group of women who did speak directly until we discovered that everyone hated us. I heard that people said I was arrogant, didn’t know anything and just behaved like a foreigner and hung around foreigners. So I discussed the situation with the other women, and we decided to make compromises. We just let them have their meeting and after the Korean men had left the room we talked with the foreigner privately. If this was someone who had been working in Korea for a long time, he understood. If not, we just explained very briefly. It was easy enough to distinguish between employees who were competent and those who were not. After watching the successful women in my company, I saw that they tried to be very polite with the other Koreans and just behave in a way that people could accept. They were very kind to everyone and were careful not to hurt people’s feelings. Then they talked privately about their own area when they needed to. They had learned to stay focused on what they were doing. 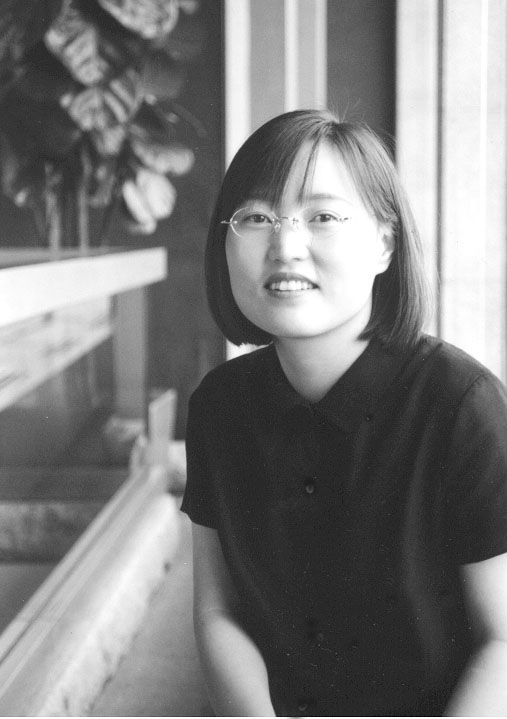 A year or so earlier I interviewed my friend Ji-young. We started by talking about a place where she was doing some work, a company where the two secretaries were nver asked to go to lunch with everyone else, which was very much different from my own experience of work-related lunch out, where everybody went together. I did some interpreting at a company where all the male employees had lunch together. They never asked the women to join them. The two women had lower positions. They were very reserved and seemed to lack confidence in themselves. They reminded me of myself as the graduate of a commercial high school. I began to work in 1984, it was even before the end of the semester. It’s customary for commercial high school students to start out as job trainees. In my division there were two other women. One was a university graduate, and the other one was just like me, but two years older. There were about ten or so male workers—all at least ten years older than I was. At school the teachers always told us to obey the men. All I knew was to say yes—always—to make coffee, to behave like an “office flower.” I felt as if I had just been tossed into the water and told to swim. Since everybody was older, I didn’t know how to behave. I went to girls’ schools, and at that time we were supposed to be very, very deferential to the teachers. My father was working abroad, and both my brothers are younger than I am. I didn’t know how to interact with men. I would answered the phone, and the caller would want to talk to the guy in front of me, who happened to be thirteen or fourteen years older, but he didn’t have a title, so I couldn’t address him as, maybe Kim Taeri. I was supposed to call him by name, but I felt very awkward doing that. It was taboo for a young girl. So I had to run over to him and tell him he was wanted on the phone. Anyway, I think those two women kept their distance from the men in the office because they felt that they weren’t as good as they were. I have an M.A. in translation from the Hankuk University of Foreign Studies, and I do both translating written texts and oral interpretation. I find translating at home very attractive, but not everyone is satisfied with it. A person has to be very well organized and schedule her time properly. I work very fast, directly on the computer, so I can make 100,000 won in two hours. I have never missed a deadline—and that’s extremely important. Because I am very focused when I’m working, I have quite a bit of free time, and I like that. When I first began this job, I got assignments through acquaintances, mainly through former classmates. With time I have built up relationships with steady clients. It’s funny. Calls from potential clients are quite predictable. I get a call. My rates are more than twice what the so-called ‘translation agencies’ charge, but I don’t think it’s too much because I provide top-notch translation. Anyway, the caller says he’ll call me back. I don’t hear from him again until he’s tried one of the translation agencies and found he can’t use the translation. So now it has to be done immediately. I may have to pull an all-nighter, but it gets done. Sometimes the client becomes a regular. These days a lot of people are interested in doing translation, and there are lots of ads for training schools which are just out to take advantage of people, not to train them properly. But the clients are not fooled. They won’t spend a lot of money on a low-quality translation—at least not more than once. My position is quite good compared with other Korean women. Three days a week I do oral interpretation for an American manufacturer who is connected with a Korean research and development company. When the people at the Korean company want me to do something, they ask very politely. For one thing, having a master’s degree gives me status, and for another, being a freelancer places me outside their control. Besides, I work directly with the boss, and I’m paid by the American manufacturer, not by the Korean company. For me it’s easier to work with Westerners than with Koreans. If I worked for a Korean of about the same age and rank as my boss, it would be extremely difficult. Korean men want to assert their authority. The boss’s secretary is very professional, and her English is quite good, but she’s very young and rather difficult to get along with. One day one of the managers complained and called her one of the so-called new generation. I agreed with him until he said that, since she was Korean and employed by a Korean company, she should take the Korean side and not be so loyal to the boss. I do walk a tightrope. On the three days I work at the company, I have lunch with the Korean employees, not with my boss. The company cafeteria is very good, so everybody has lunch there. I chat with people, and sometimes people ask me for advice about learning English. Also, during the short breaks I pick up things about what’s going on in the company. Once a week I go to the company headquarters with the boss, and we spend more than three hours in the same car, so it’s natural for us to talk about things in the company. I think it’s my duty to tell him what’s going on. He seems to be totally unaware because people don’t tell him anything. That’s even true of his secretary—the one the manager thought was too close to the boss. So I try to help him understand the Korean way of thinking. He’s been here for one year, and he has two more to go. He’s told me that for his first year he left home in the dark early in the morning, got home in the dark late at night and spent the whole day in the dark. He had no communication. The second-ranking guy reports to him, but he doesn’t mention the bad things. He just says everything is okay. Then finally he has to admit that there’s a problem. So my boss is sandwiched in between the home office and the Korean company. He said he’s been trying to find an interpreter for a long time. The bosses in the home office said he didn’t need an interpreter because some of the guys in the company speak English and his secretary speaks English. He put up with the lack of communication for almost a whole year until he made inquiries. There were a lot of applicants, but no one he felt he could spend a lot of time with or trust with confidential information. One day, he happened to meet one of my former classmates, and she recommended me. I work for him on Tuesdays, Wednesdays and Thursdays. I was supposed to attend the staff meeting with the boss and the managers. I did attend twice, but now he prefers me not to attend because he often loses his temper, and the managers get embarrassed at being scolded in front of a woman. So on Wednesdays I do some translation and help him with other things. On Thursdays there is a confidential meeting with division managers and high-ranking managers. They discuss everything. I sit beside the boss and take notes, which is faster than simultaneous translation because the meeting isn’t interrupted. He reads the notes and participates in the meeting. I don’t understand how he could have survived a whole year without me. Thursday is the day he needs me the most. The meeting is at 8:30, so he picks me up at 6:00 in the morning. When the headquarters moved last December, he hesitated to ask me to go with him. I don’t know how typical it is, but he considers my situation, whereas a Korean man would probably have felt he could order me to go because he’s paying me. Because I knew he needed me, I offered to go. He was very pleased. That meeting goes from 8:30 to 10:00. He tries to take care of everything else quickly so we can leave for Seoul before the traffic gets bad. I appreciate that. Fascinating. Kudos to your friends for their accomplishments. Keep them coming, dear friend! !